Kerala feels very different to the rest of India we’ve seen. I’ve mentioned before the lush greenery that envelops the space between the brickwork, but it became clear to us that there was something more than just this. 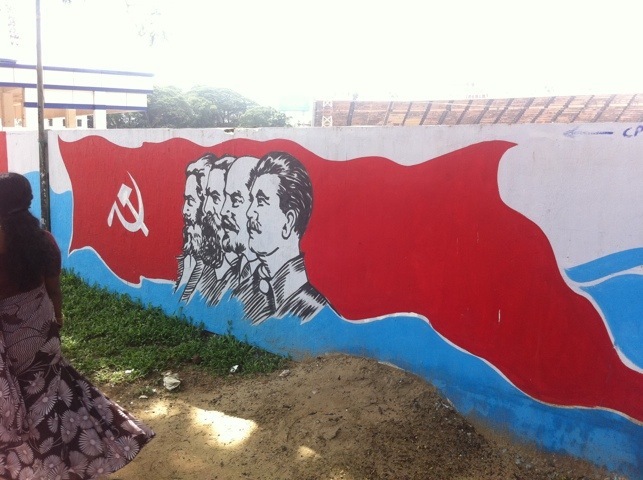 Firstly, Kerala’s very obviously communist, with red flags and slogans painted everywhere. The government has had a good success rate with tackling poverty, which was clearly evident by the lack of street kids which have followed us around elsewhere. Secondly, Kerala’s the first place in India that we’ve seen Churches – and although only 20% define as Christian (compared to 50% Hindu), it’s certainly the most visible religion, with churches, chapels and crucifixes everywhere. Combined with the colonial buildings leftover from Portuguese and British periods of influence, this gives it a distinctly European feel. 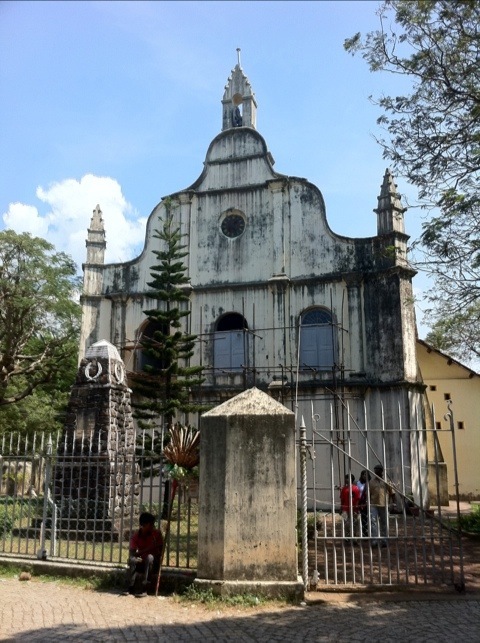 We especially appreciated it on a walking tour of Fort Cochin, between the Santa Cruz Basillica and the St Francis Church, built in 1503 and the oldest European church in the country, on the way passing the former parade ground and that classic English institution, the Members Club. Kochi is a city spread across a clutter of both natural and manmade islands on the coast, with the tranquil Fort Cochin where we stayed a stark contrast to the container ship docks and naval air base across the water. 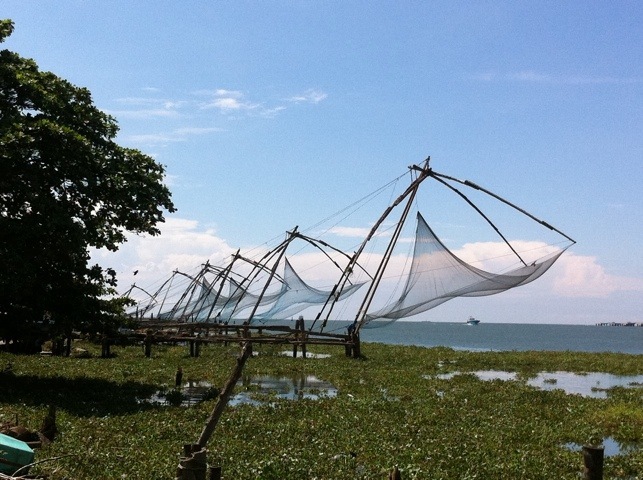 The city is most famous for its iconic Chinese fishing nets (pictured below), which require at least four people operating them to haul in their catch. Sadly we didn’t see them in operation, but did see a lot of fishermen with poles fighting a losing battle with the floating water hyacinth that clogs up the waterways all around here. 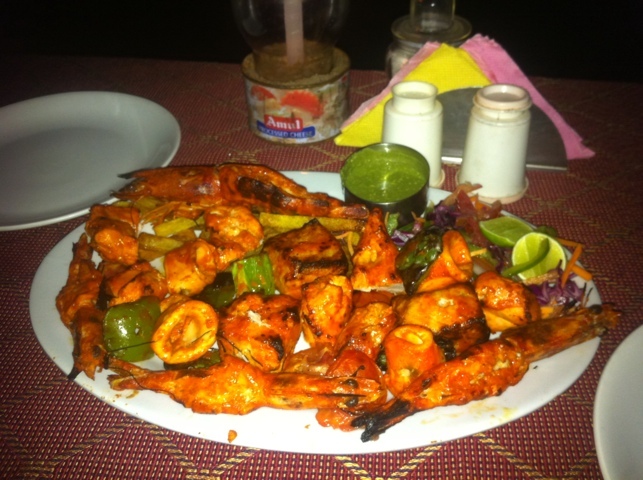 We were staying in a huge bargain room above Oy’s Restaurant, home to some of the tastiest fish curries we’ve ever eaten – a great base for our final stop in India. From here, we made what seemed like a marathon trek down to Mattancherry, home to the quarter somewhat crudely known as ‘Jew Town’, where there’s a synagogue and a suite of antique furniture shops, which were started by entrepreneurs who bought up the possessions from Jews migrating to Israel en mass in the fifties. We also found (after nearly giving up in the heat) the Dutch Palace, now a museum on the area. 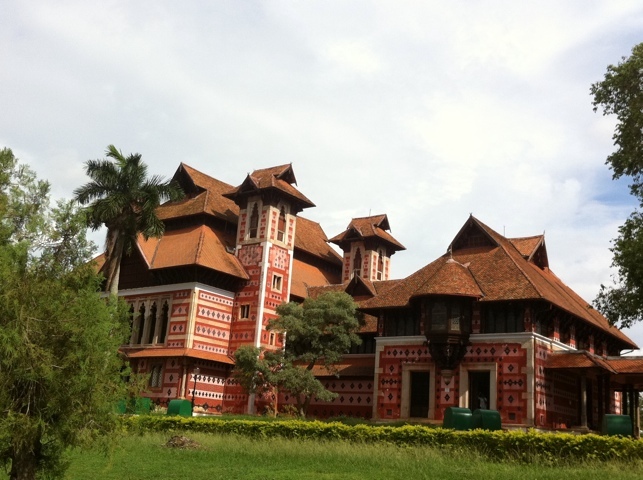 Kerala’s present day radical politics may have found some inspiration in the customs of the past – we learnt about the commanding role women used to play in the family, with inheritance following the female heir in stark contrast to the west. The exhibition also told us this is not the case anymore – although women still have an elevated status compared to elsewhere – with the elimination of this system a result of the ‘modernising reforms’ brought in by the British. That’s progress for you! Our final night in India saw Laura don her Sari one final time, and us go to a night at the (tourist) theatre, to witness a bit of traditional Kathakali ‘story-play’ – something mentioned in ‘The God of Small Things’, if you’ve ever read it. Before the show, we got to see the make-up going on, and then an intro to how the art form works, with nine facial expressions used to express emotions – from obvious ‘love’ to the more confusing ‘pathos’ – combined with a sign language, movement on stage, and live music. Most impressive was the combination of costume and make-up on the two male performers, who were utterly transformed – and we were transfixed, even if the somewhat misogynistic story of the evil female seductress didn’t appeal to our tastes. As we left the performance for a meal to celebrate our time in India, the heavens opened, and we finished a memorable five weeks dining on tuna and prawn curries while watching the thunderstorm around us – an electric experience in more than one way, and one we’ll certainly be back to repeat in the future. PS. One quick reminder of home! Our journey on from Alleppey took us to the beach at Varkala, a stretch of sand between bright red cliffs and the gorgeous translucent blue of the ocean. As we bounced through the network of back streets to our guesthouse, we wondered if perhaps we’d somehow got the address wrong. 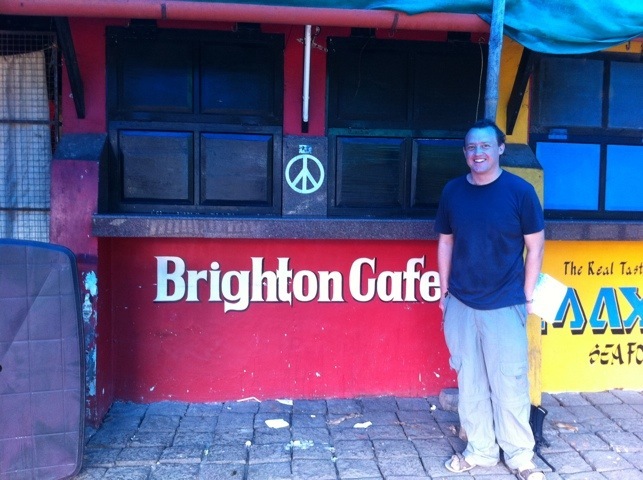 We were staying in South Cliff, described as being a bit quieter than the tourist hotspot of North Cliff, but I don’t think we’d quite realised that the place would be nearly deserted, and the popular cafe that was recommended closed – it not being high season. It was certainly peaceful though, with a great cliff-top perch. 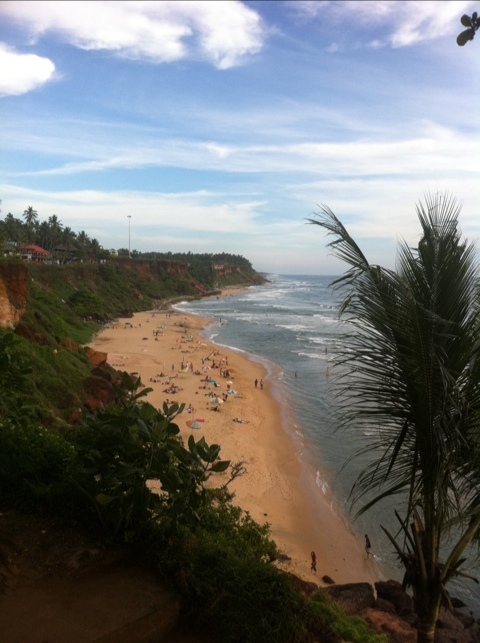 Varkala’s really a town of two halves, with the main urban centre a few miles from the tourist-dominated beach. The inhabitants of the two only really seem to meet when arriving and departing – in the more conventional sense through the bus or train station, but also more spiritually at the beach, as the waters are considered holy to Hindus. Many have their ashes scattered after cremation in the waves at the south end of the water, away from the multitudes of white westerners in the next cove further north worshipping a different kind of God – the sun. As we ate breakfast one morning at a beachside cafe alongside the fishermen counting out their catch, we were able to watch the ritual of a mourning family dressed mainly in white, with a few men taking an urn to the water in a final farewell. It was strange to have this happen amid the bustle of restaurant touts trying to attract trade, and rickshaws jostling to pick up a ride – but then this close interplay of religion and everyday life is very typical of the India we’ve seen. Less pleasant was the juxtaposition between the mourners fully clothed in white and the stream of white tourists trickling past in beach wear, something we were told was an absolute no at an Indian holy site. I was surprised at quite how tolerant the locals were, particularly as we were some distance from the western enclave of North Cliff, and this was after all part of a funeral. We spent a couple of days enjoying the sun and sea of the northern beach, Laura progressively building on the bronze tan she started in Spain, and me just going straight for the traditional lobster look. Amid tasty meals of seafood, we had a great snack of a whole fresh pineapple on the beach, cut and sliced by the woman in the air in front of us, a great bite of refreshment – and entertainment! Trivandrum is the capital of Kerala, and was our next home for a couple of days, as well as the southernmost point of our trip round India, about 40 miles from the tip of the subcontinent. More importantly for us, it was a chance to try some true South Indian food – the masala dosas that Laura’s written about – as well as a brief retreat to our first western delights in weeks, in the form of pizza and pasta from a fantastic Italian restaurant in a middle class suburb. 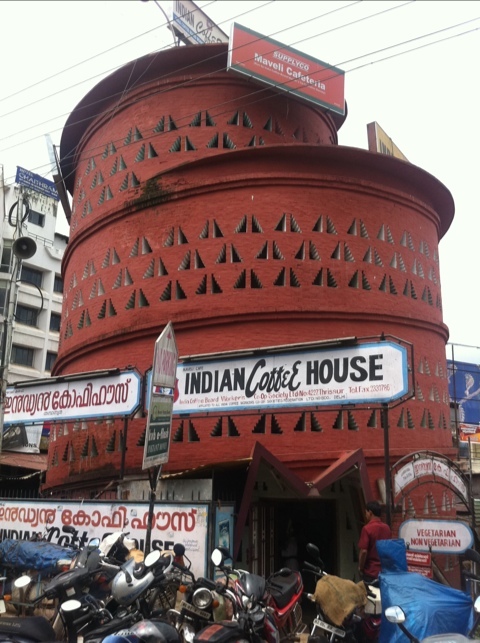 We also got to stop for a quick bite to eat at the memorably Indian Coffee House near the bus station (pictured above) – designed by a British architect living locally, with the interior one huge spiral. The city itself is a mix of the bustling and modern alongside some lovely green spaces and the gleaming white Secretariat building, home to the state government. A lot of the architecture in the town is typically Keralan, with wooden structures and red roofs. 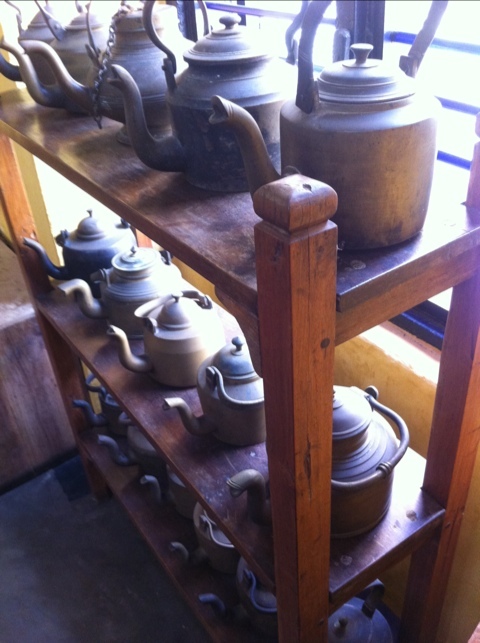 A highlight was the magnificent Napier Museum, a real splurge at 10Rs (15p) for the two of us. Set in a leafy green park, its interior is a world of colour, with candy stripes in yellow, blue and pink on the walls and a high wooden ceiling – not quite as garish and horrible as that sounds! The museum showcases some amazingly detailed carving, including ivory so thin it’s translucent – and a set of ornate concentric spheres that had us marvelling at how they’d been created. In the same parkland as the museum is the city Zoo, an unexpected success. We’ve avoided zoos so far because seeing animals in cramped cages with barely enough room to turn around is not really our thing. Fortunately, this zoo was supported by WWF (the environmental group, not the wrestlers, which would be entertaining but odd) – and so the animals were generally in large open enclosures, free to run around. Having said that, the big cats were all in cages while we were there, but we’re assured this was a temporary measure – there was a huge space nearby without any animals in. Anyway, ethics sated, we saw tigers and leopards, lions and hippos, as well as spotted deer, elephants and zebras, and alligators. Actually it was the first time we’d seen almost all of the above in India – and we can now tell you that the roar of a lion is a scary thing! As a final bit of capital tourism, we popped in to the Puthe Maliga Palace, its exterior roof supports forming a line of fantastically carved wooden horses. There were also thrones on display – one made from some 35 ivory tusks (now those are elephants to be pitied), and another entirely in crystal. These were unfortunately not for us, and so we instead made our way onto the seats we’ve become accustomed to, on the train heading back north, and to our final destination in India. 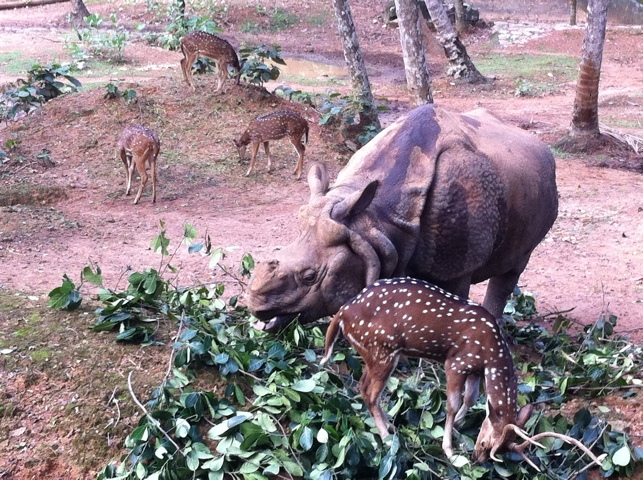 We arrived in the southern state of Kerala to a thunderous welcome – a rainstorm. It was a bit of a shock for both of us, the first rain we’d seen in nearly a month in India and a refreshing reminder that this is the wettest state in the country. The city of Alleppey sits nestled on the west coast astride a pair of canals between the beach and the inland waterways known as the backwaters. In lush contrast to the north, and particularly the parched and desert-like Rajasthan, everything is green and it feels like a tropical paradise: palm trees silhouetted against the sky, coconuts growing above us, and huge bunches of tiny bananas on the table in our guest house, freshly picked from the garden. It’s always a bit strange arriving at a place in the dark – and especially in the pouring rain. 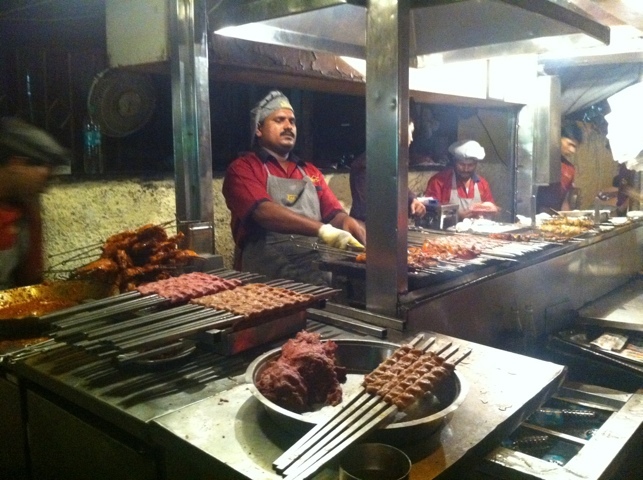 We spent a difficult half hour searching the dimly-lit puddle-filled streets for somewhere to eat (and succeeded), before taking a fun rickshaw journey home the way we’d come, now totally unrecognisable in the gloom of the night. It was a memorable experience, with us shouting overconfident encouragement to the driver – “just a little bit further now” – as we jolted and splashed our way in the right direction but without the faintest clue as to why we hadn’t seen our place yet. As it turned out, we’d walked A Long Way on the trip into town and hadn’t realised. Fortunately despite not being able to agree a price up front (hard to do without a clear destination! 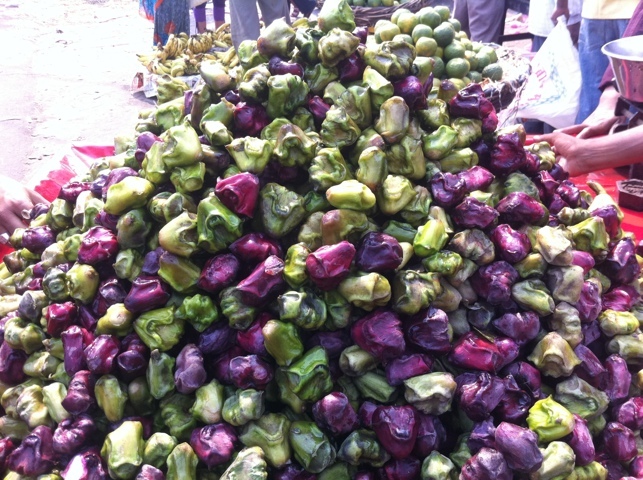 ), it only cost us 40 rupees, or 60p. We spent a couple of nights resting from our journey and staying in a cute ‘cottage’ in the back garden of a house, bordered by paddy fields and narrow waterways. We even had our own veranda from which we could sit out and admire the fireflies at night, their lights blinking on and off slowly like tiny indicators in the dark. It was amazing as the darkness closed in around us and we could steadily see more and more flashing flying lights around us, blazing erratic trails through the air. Unfortunately they were also accompanied by swarms of mosquitos who thrive on the abundant freshwater – and so we had to beat a hasty retreat into the mosquito net protection of inside. We spent a quiet day wandering round town (much less murky in the sunlight) and made it to the beach, where a few cafes look out over the grey-yellow sand to the dilapidated old pier and the ocean beyond. The rusting black silhouette reminded me of the West Pier in Brighton, a monument to better days – and presumably a time when this place was a teeming resort. 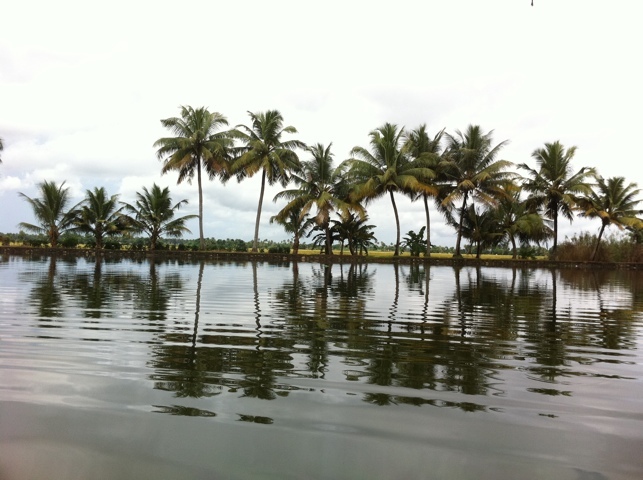 Kerala’s main fame these days is as home to the backwaters, a set of rivers and lakes that stretch for miles inland. 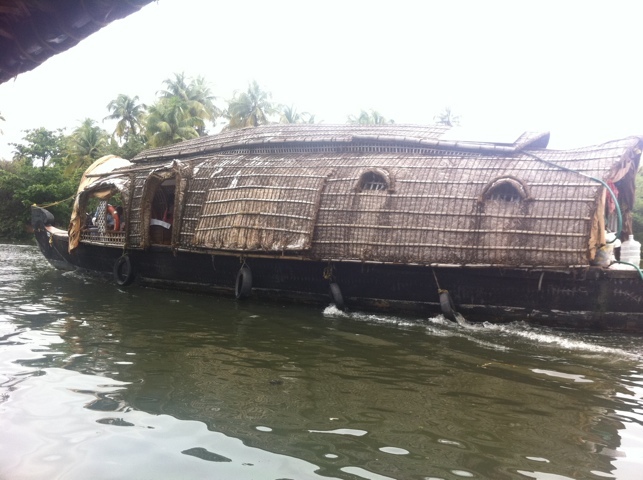 This is now a big tourist industry, with some 500 houseboats available to rent in Alleppey alone. 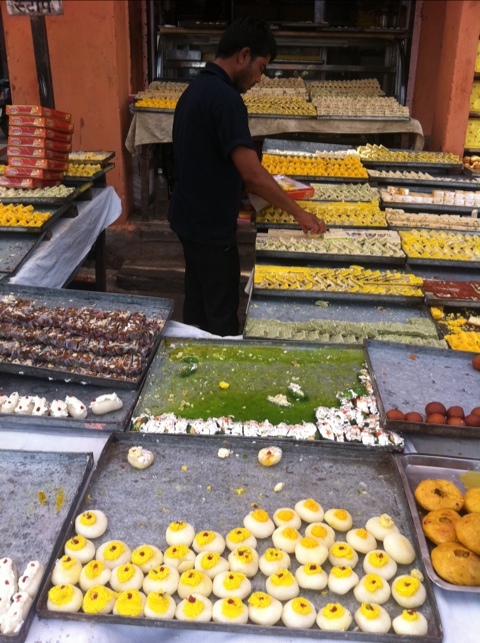 It’s also something my Dad did when he visited Kerala years ago – and that we were keen to try for ourselves. I think Laura put it best when she described the houseboats as “like wicker chairs on water” – from a distance it looks like they’re made solely from woven bamboo, with associated concerns about their seaworthiness. Fortunately, up close it becomes apparent that they have solid metal frames, even if this somewhat dilutes the aesthetic. They’re also not quite the romantic delicate boats we’d envisaged in our minds – these things are bamboo-coated juggernaughts, many with multiple en-suite double bedrooms, air conditioning, a second story, and satellite TV to cap it off. It did feel slightly like a traffic jam on the M25 as we first set off, a long tailback of boats all heading in the same direction, chugging along slowly together while spluttering smoke from their exhausts. Fortunately, we soon reached a huge lake, and the boats all scattered in different directions, peace and tranquility restored. We’d hired a boat from our guest house which we were pleased was smaller than most, with just a twin room, bathroom, kitchen and deck under cover from which we could watch the passing scenery. Nonetheless, even at this scale it was a world apart from the narrowboats we’ve holidayed on in the UK, where a boat the same size would easily sleep 12. On those, everything – beds, seats, to toilets and showers – is in miniature to make the boat smaller. Here we had full size fittings, and space on deck for a dining table, actual wicker chairs, and also deck chairs to recline in! 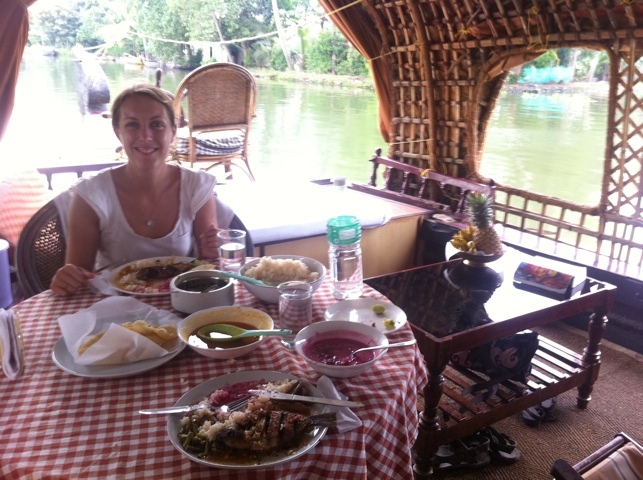 The boat hire also comes with a three man crew who prepared us delicious food for the three meals we ate on board. It’s no wonder this is the most expensive thing we’ve done in India. Our night sleeping on the water wasn’t entirely without incident – for as we found to our surprise at about 1am, we had a stowaway! We were both woken in our beds by the sound of something gnawing loudly, coming from the direction of our feet. It was loud, and we both sat there for a bit, adrenaline pumping, trying to work out what on earth it could be. A rat? A man-eating spider? 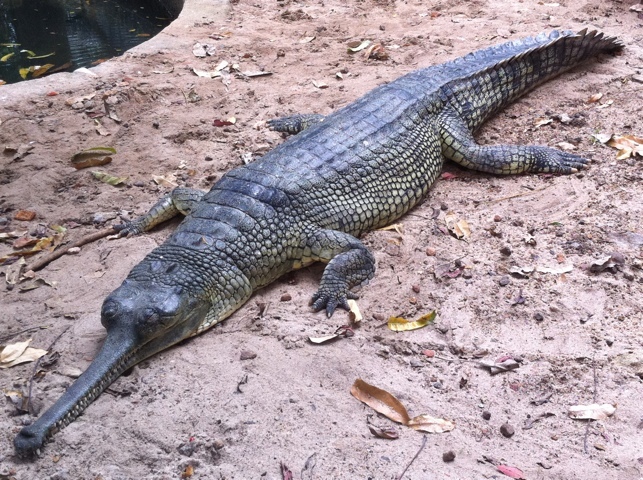 An alligator?! It was with some trepidation that I picked up the water bottle and left the safety of the mosquito net cage to take on whatever was dining at our expense. Nothing! It seems that our stowaway must have been a mouse who’d made it into the inch-thick cavity between the two walls and was happily munching away at the tasty wood of the boat. The large hardboard walls were acting as a speaker cone, amplifying the sound and making it sound much larger than it really was. After enough thumps on the wall to wake half the village nearby, it finally stopped nibbling and scurried off, leaving us to try to get back to sleep in our alert state and hope it didn’t return for desert. Fortunately, it didn’t! Our final day in Alleppey left us with some time to kill after departing the boat at 9am, and so we spent a tranquil couple of hours on a much smaller ‘canoe’ boat (not an actual canoe), traversing some narrower waterways and appreciating the beauty of the area from closer up than our houseboat had permitted. 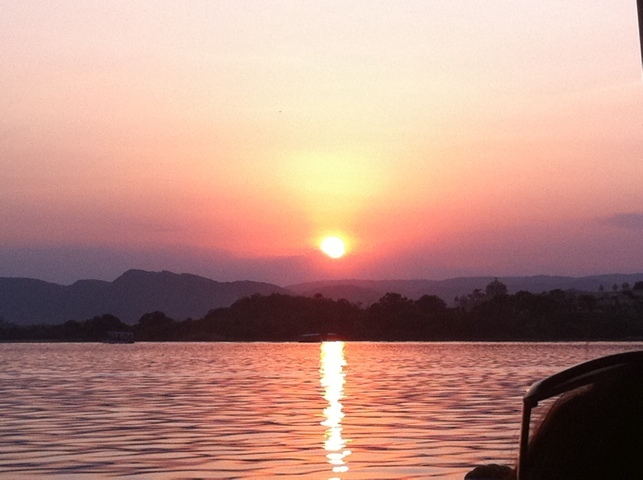 It was a great finish to our time on the water – a highly recommended excursion for anyone visiting the area!